Set up Fire OS and install the apps you'd like to use (e.g., Netflix, Hulu+, Plex). Once connected, you can use Harmony to control your Fire OS device and set up Activities that include it. Select the ADD DEVICE button at the bottom of the screen, followed by ENTERTAINMENT DEVICE. 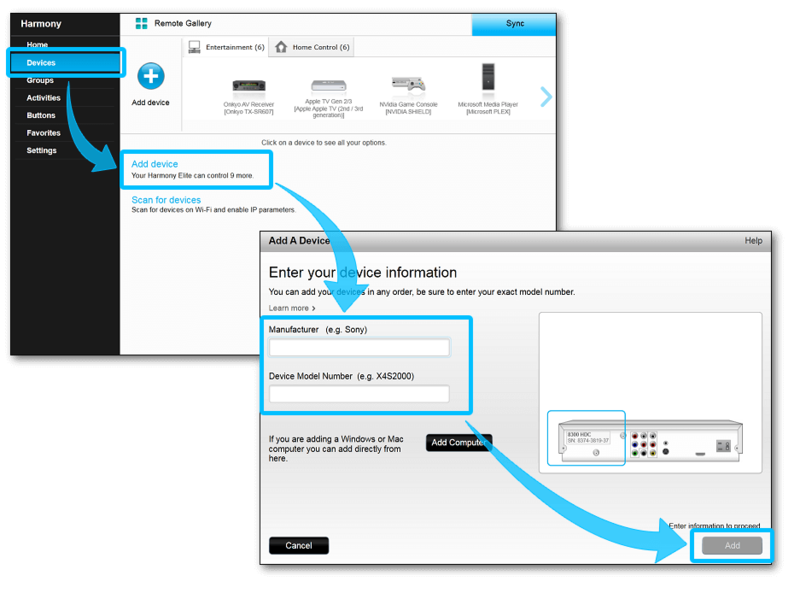 Enter the manufacturer and model number for your device, then tap ADD. If you have multiple Fire OS devices, select the one that you like Harmony to control. Continue through the series of questions to finish creating your Activity. 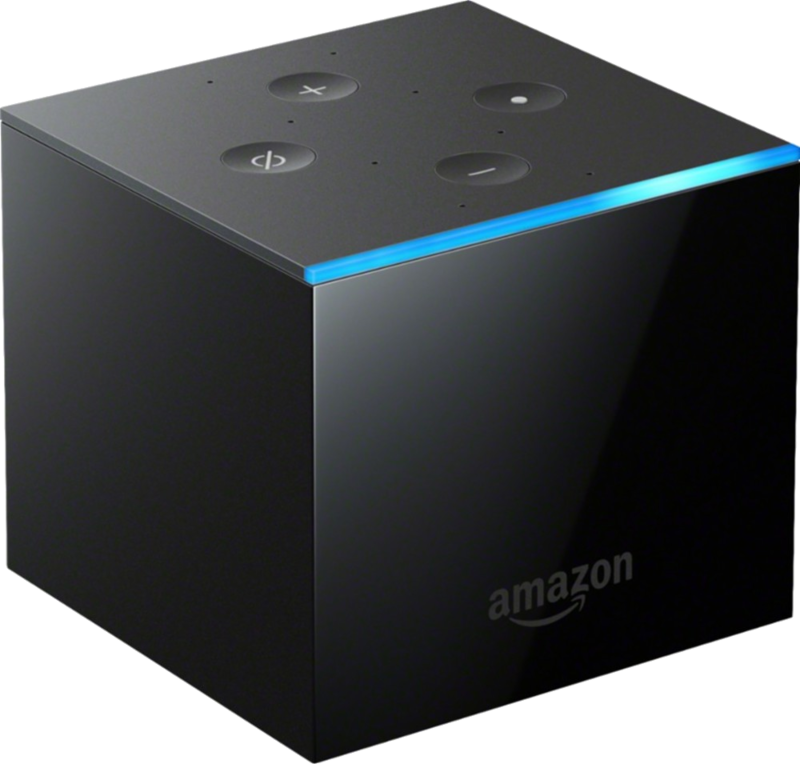 If you're using an Amazon Fire TV Cube, we recommend disabling CEC once your setup is complete. Select the Devices tab on the left side of the screen, then the Add device link near the center of the page. Enter the manufacturer and model number for your device, followed by Add. If you have multiple Fire OS devices, select the one that you'd like Harmony to control. After creating a Fire TV Activity, you must launch your Activity using the Harmony mobile app in order to initiate Bluetooth pairing. Once added, you will have to go through a one-time Bluetooth pairing process. 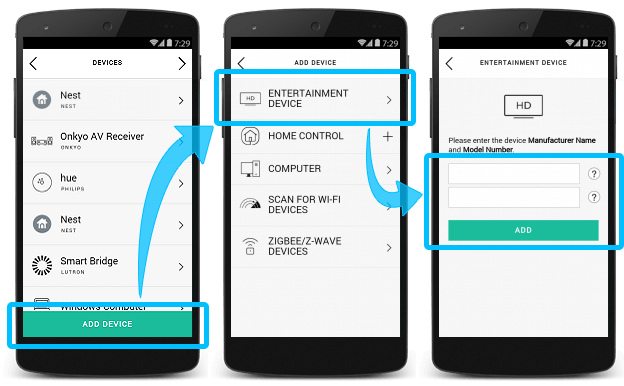 If setting up using the Harmony mobile app, the pairing process will occur while creating your Watch Fire TV Activity. 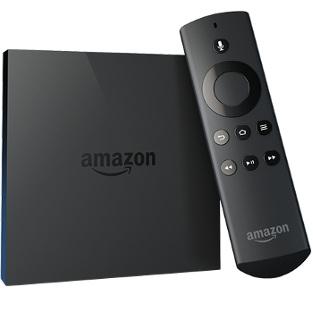 If setting up using the MyHarmony desktop software, you must use the Harmony mobile app to launch your Watch Fire TV Activity for the first time which will initiate the pairing process. Select the Activities tab on the left side of the screen. Select the Add Activity button. Select the Fire TV Activity type and select Next. Continue through the series of questions to build your Activity. Once done, remember to sync your remote. 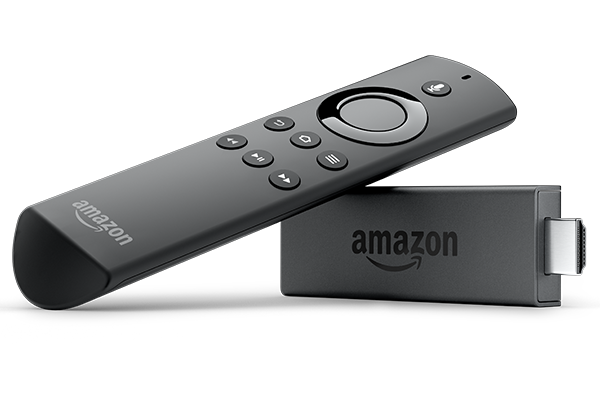 You must launch your Watch Amazon Fire TV Activity for the first time using the Harmony mobile app. Using the Harmony mobile app, connect to your Harmony hub. Launch your Watch Fire TV Activity. Harmony should prompt you to initiate Bluetooth pairing. Text entry is possible using the Harmony mobile app. Harmony displays commands specific to your Watch Amazon Fire TV Activity on your remote screen. You can add, remove or rename them. You can view common Fire OS device commands on your phone or tablet screen. You can add, remove or rearrange these commands. The Harmony Companion app needs to be installed on your Fire OS device before Harmony Express is able to control it. Launch the Harmony Express app and select Device Settings. Select your Fire OS device and tap Install Companion app. Follow the on-screen instructions to complete the installation process. 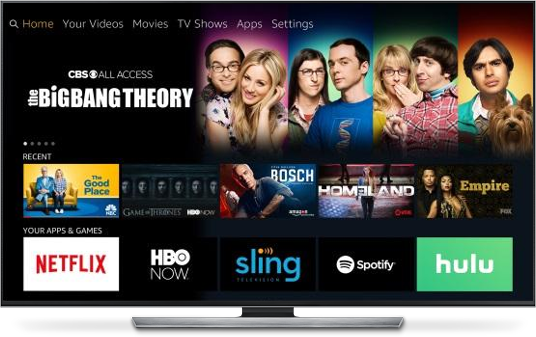 If you own a Television that has Fire OS built into it, we recommend using your voice to change between inputs for watching live tv and transitioning to Fire OS app content. 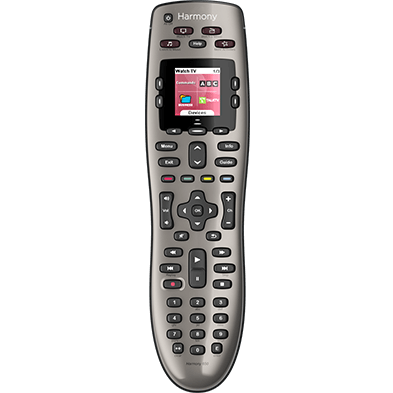 Using the Harmony Express remote to navigate between the inputs will cause the devices to be out of sync in when you try to control them. Your Harmony Express remote connects with your Alexa account, allowing you to control your Fire TV. If you’ve been using another Alexa-enabled device to control your Fire TV and have added the Fire TV Alexa skill, there may be voice commands that conflict with Harmony Express. If you’ve previously added the Fire TV Alexa skill and are having issues when sending commands, you can allow Harmony Express to control your Fire TV instead. To do so, press and hold the OK button on your Harmony Express remote and say “Turn on Fire TV”. 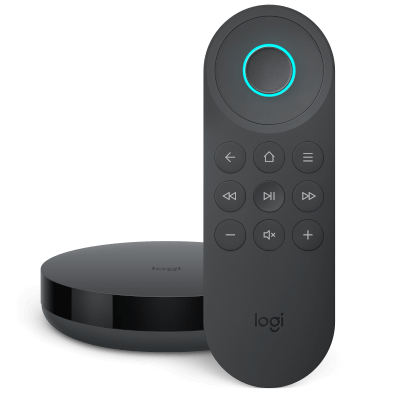 When using this method, subsequent commands will come exclusively from Harmony Express and will not use the Fire TV Alexa skill. Harmony pairs and controls this device using Bluetooth. Your Harmony hub and this device must be within 15 feet (5 meters) of each other; however, they do not require direct line of sight. You will be prompted to pair Harmony with this device during setup, or on first time use for Harmony Ultimate or Ultimate Home remotes. Harmony uses your Wi-Fi network to launch apps (e.g., YouTube or Netflix). 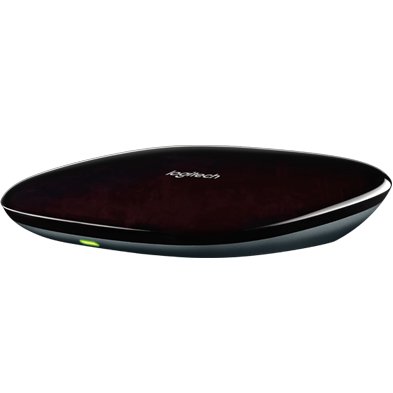 For device control, such as adjusting the volume or changing the channel, Harmony uses Bluetooth signals.